I love the Friday before Thanksgiving. It is on the cusp of a weekend, followed by a short work week and a four-day weekend! Although there is a Transgender Day of Remembrance event nearby tomorrow, a scheduling conflict prevents me from attending. Family comes first. I select the images I use in the “Femulate Her” sidebar for a variety of reasons. Usually, because I like the outfit; it is something I wish I owned or could wear. Occasionally, I select the image because in addition to liking the outfit, the model has physical attributes that resemble a transwoman. Today's “Femulate Her” image is an example of that in my humble opinion; your mileage may vary. Professor Schildroth e-mailed me to ask if I could do outreach at her two human sexuality classes. I happily accepted her invitation, so I will be visiting Southern Connecticut State University soon. I love 30 Rock; it is one of the very few television shows I always watch. It seems that during the past year or so, every episode has at least one trans reference. Last night’s episode had two. Maybe I don’t watch enough television and trans references are more common than I think, but it seems to me that 30 Rock has a lot more than the other television shows I frequent, not that there’s anything wrong with that. 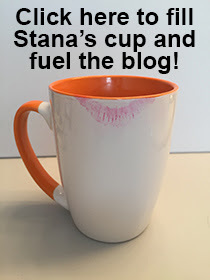 Yesterday, a co-worker who knows about Stana wore black calf-length boots with a 3- or 4-inch stiletto heel. I said I liked her boots and that led to a girl-to-girl conversation about boots, footwear, and the local consignment shops. I showed her my photo from Saturday night and she loved my dress and shoes, which led to further girl talk about high heel slingbacks and the pitfalls of wearing them. I enjoyed the girl talk. And I love being a girl! You were in "The Pink Place", honey!